Man oh man, I couldn’t wait for dinner tonight! I was driving to work and for some odd reason at 5:30am I’m thinking I want Buffalo Chicken for dinner. After work I rushed to Trader Joe’s and picked up my chicken and I just couldn’t wait to start making dinner. This is one heck of a good dinner that I simply LOVE! As you know I am a huge Buffalo chicken fan, especially since I am from Buffalo and boy do I miss those chicken wings, but you know what? I liked today’s recipe better than good old chicken wings. How could I not, its cheesy, spicy and perfect!! To make this chicken it’s super easy!! I cut my chicken horizontally and just stuffed it with a little cheese, folded it over and it was ready for the sauce. To make the hot sauce, I melted some butter in the microwave, added Franks Hot Sauce and a pinch of celery salt. I brushed it on my chicken and on the grill it went. I know a lot of you can’t grill right now, but don’t let that stop you from having this wonderful dish. You can make it the same way, just by cooking it in the oven. Just heat your oven to 375 degrees, spray a baking dish with cooking spray, add the chicken and drizzle the hot sauce over the top. Place it in the oven for about 35 minutes and it will be done. That was how I was originally going to make it, but with it being 77 degrees out, I just had to cook it on the grill. I love grilling season. Matter in fact this weekend it the opening of the Farmers Market! Yah!! I really think Spring is here! At least in California. Butter fly your chicken, by cutting it horizontally. Do not cut all the way through. Sprinkle the inside of the chicken with pepper. Evenly top the the chicken with cheese and fold over the chicken to close it. It should look like the chicken breast before you cut it. In a microwave safe bowl (I used a pyrex measuring cup) melt the butter for 8 seconds. Stir in hot sauce and celery salt. Brush one side of the chicken with hot sauce mixture and place the hot sauce size down on the grill. Brush more hot sauce over top of chicken. Cook for about 7 minutes. Flip the chicken and brush on remaining hot sauce and cook until no longer pink; about 5 minutes more. Serve with a side salad, celery, carrots and ranch dressing if desired. You did NOT stuff this spicy chicken with cheese?! Genius I tell you!! Can it be made on a George foreman grill? I never used a George Foreman Grill, but I don’t see why it wouldn’t work? I don’t see why not. Just keep in mind that the grill slopes downward for grease to run off, so I would make sure that the side of the chicken that you cut open for the cheese is facing the back of the grill so gravity doesn’t cause all that hot delicious cheese to run out of the breast as it melts! I think I might try this stuffed with cheddar.Love the idea. This recipe looks delicious! We grill all year round even though we live in the Chicago suburbs. Sounds crazy, I know, but it works, and it’s always good. So I love this dish, especially grilled. It looks tasty and healthy both. Thanks for sharing! It doesn’t sound crazy at all. When I lived in Buffalo,we would grill all year round to. Food just tastes great grilled. What a great idea!! Looks fabulous!! I make grilled Buffalo Chicken for salad all of the time. I never thought to stuff it with cheese! Everything is better with cheese!! I agree! I love cheese! I have been craving it like crazy too! I read this recipe name to my husband and he said YES! Pinned! Thank you for sharing it! In the directions / recipe I do not see where you stuffed the chicken & melted the cheese. Did you do that at the end of the grilling? Can you elaborate? Thanks. Looks so good Iam going to make this weekend. Do I bake it first before I add the cheese ? Thank you Lorraine! I hope you love it as much as we do! Oh and no you do not bake the chicken first then add the cheese. You need to put the cheese in the center of the raw chicken, then bake it. Hope this helps. have made this twice now but have used my Pampered Chef grill pan because the BBQ is hidden under a snowbank. Totally delicious and so, so easy. Would definitely serve this to company. I am making this asap! How does the cheese not just melt out all over the grill? Just made this for dinner…. O. M. G. It was out of this world amazing!! Thank you so much Erica! 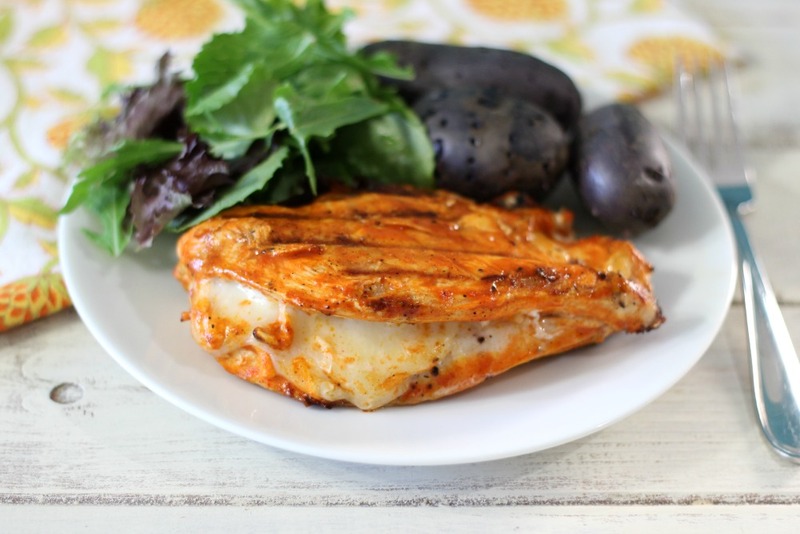 I have to say this is one of my all time favorite chicken recipes! Oh I am sure it is just as good in the oven! You have to let me know how it turns out! 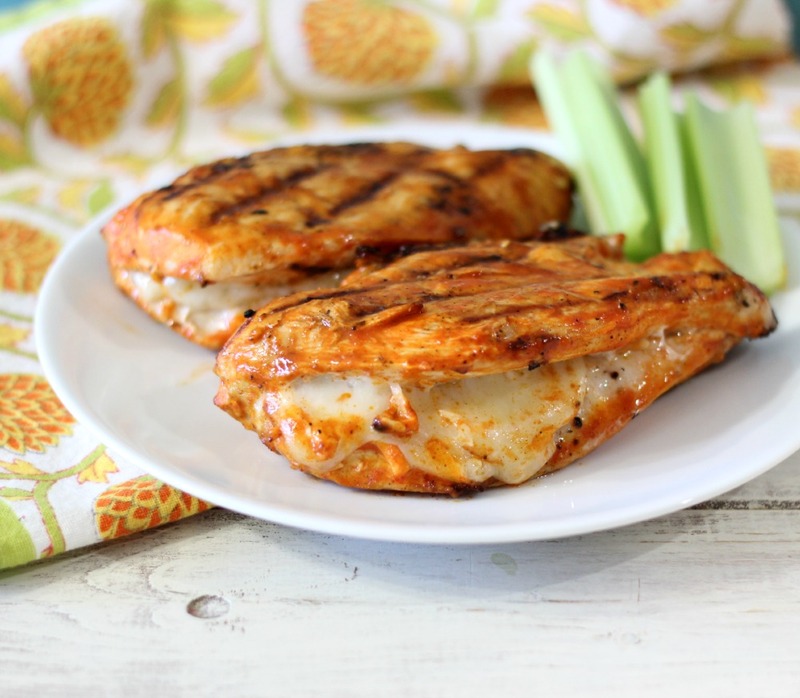 The Ranch Buffalo Chicken sounds amazing! I love cooking in the crockpot! Made this for my hubby and I tonight and it was awesome! I was told to put it in the ‘make again’ folder lol! Thanks for the recipe! If I do this in the oven, how long should it cook for?? I made this for lunch today and am having the other half for dinner!!! It was absolutely fantastic!! I had all the ingredients and it was quick and easy!!! Thank you so much!!! That was delicious the hubby liked it too..thank you 🙂 I had to use regular hot sauce though because all 4 stores I went to had no franks hot sauce! 1/4 cup of cheese is really enough for all that chicken? That’s about what I used. Use a pinch more if needed. Enjoy! Can this be done on a shove top? Hi Tansiha, I don’t see why not. Just make sure the chicken is full cooked. Add a little it of oil in the pan before you add the chicken. Let me know how it turns out. to make this today on my stovetop. I’ll cook it with some olive oil & butter. Sounds yummy! Let me know fi turns out, I may try it myself for dinner. How spicy/hot is this recipe? I really want to try it tonight, but i don’t want it to be to “hot” for my son. I would go a little lighter on the hot sauce. It’s pretty spicy. I think I’ll use BBQ sauce instead of hot sauce. We aren’t much for spicy foods. Sounds yummy! That’s a great idea Donna! I love it! you might try Hidden Valley Spicy Ranch. Frank’s is too hot for me, but I love the spicy ranch! Great idea!!! I love that! This is heaven on a plate right here! Two of my most favorite things to eat all in one! Genius!! Thank you Melissa! I have to agree! This is one of my all time favorites too! This was so yummy! ☺️ thank you! Your welcome! I am so glad you liked it! It’s such a nice simple dish that we love! Ha ha! I understand! I am from Buffalo, NY and we used to grill in the snow and in our boots too! I hope you enjoy this recipe as much as we do! Ha… That’s funny! I am from Cali, never experienced snow till I married a canadian and now I am a snow queen! lol. I thought my hubby was crazy at first clearing the grill of snow and tredging out there, but I guess it’s normal. Anyway, this recipe, trying it tonight!! It looks amazing, I was jumping with excitement showing it to him and now he can’t wait either. And we bought Franks buffalo sauce @ costco, it’s big, so always looking for ways to use it up. Thank you! I hope you like it! I think you will if you are a Buffalo Chicken Wing fan! We just love it! I only like blue cheese with hot sauce. It’s a great combination! Let me know how you like it! OMG this is A-MAZING. Made this tonight and had to do it in the oven as my grill has 6 feet of snow on top of it. I doubled the sauce part and cooked up some brown rice. The extra sauce mixed with the rice and then the chicken over the top was fantastic. Tooth picks worked and for the cheese that made its way out I just scooped it out of the pan. Heavenly!!! Oh my gosh Meghan! I love how you made this! I am simply drooling by your creation! I am sorry you are stuck in snow, I remember those days from when I lived in Buffalo. Hi Kenneth, Let me know how it turns out! 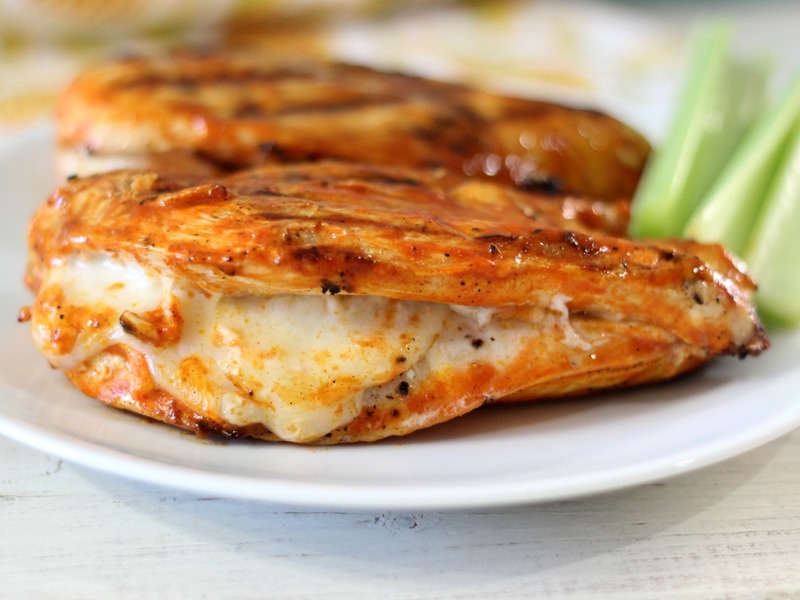 How do you keep all the yummy cheese from spilling out all over the grill as the chicken is cooking? Doesn’t the Buffalo sauce burn and drip off completely while cooking? Looks and sounds delicious (we love hot wings done the actual Buffalo way with Franks and butter). But I am a little skeptical about the method. I guess I will just have to try it to find out. I’m telling you to give it a try! You will love it! The sauce doesn’t burn and the cheese is tucked in enough to not over flow on the sides, or ozz out everywhere. Can I used Tabasco hot sauce instead of Franks hot sauce? Tabasco sauce is a little hotter in flavor, plus it may taste a little different. If you like Tabasco sauce, I would say try it. Did you end up using the hot sauce? I don’t have Franks but I DO have Tabasco. If you used it, how much and how did it taste? I tried this tonight and I loved it!! However, I learned the hard way: DO NOT touch your eyes or face for at least a week after making it! lol It was honestly so good! Ha ha! I have a hard time with hot sauce and peppers too! I can’t touch raw peppers at all, it stings! I love this recipe! It’s my favorite chicken recipe. I am so happy! I love this chicken recipe too! Thank you for telling me! This sounds fantastic but I want to try it with some kind of breading or shake n bake then put it in the oven. Nice and crispy with the Frank’s hot sauce and stuffed with cheese. Making this now. Super easy recipe for a weeknight meal and low cal too. Hope it tastes as good as it smells! I have made this twice. Easy and love it. And weight watchers friendly. I really can’t wait to try this. Nobody in my family likes celery salt. Does it taste the same if I opt to take it out, or can you not taste it? I’m going to make it tonight it looks so yummy!!! I hope you love it as much as we do! Enjoy!! Family not big on the cheese you used so i stuffed mine with blue cheese and it was to die for ! Thanks for the idea to start with. I am not a fan of spicy things….and not much of a cook….but this looks yummy! Any ideas on what seasoning I could substitute that would work with the cheese and chicken? 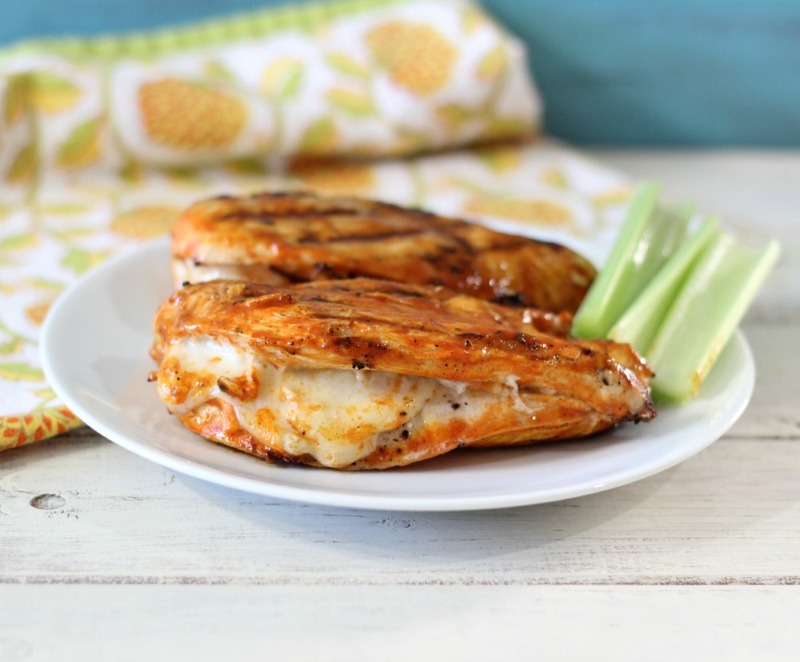 I’m not big on white meat could you use boneless skinless chicken thighs instead of breasts ? Yum, made this tonight with boneless pork chops because that’s what I had in the house. Delicious! What a great idea! I bet it was great with pork. I think I will try that. I’m so glad you liked it. I made these last night and they were delicious! My kids loved them, will make again. I am so glad you and your kids enjoyed it. This is one of my favorites. This recipe looks and sounds good but I don’t eat cheese if any kind. I would have to cook mine without the cheese. I’m sure it would taste good with just the buffalo sauce. I’m ready to try something new. I am also diabetic and get tired of eating the same meals. I need to buy a diabetic cook book and explore more. Thanks for the tecipe Robin Maxey. Have a great day. This would taste just as great with just the Buffalo sauce. I have had it that way! I understand about getting bored eating the same meals, I do too. I bet there is a great diabetic cookbook out there for you. Or just Google recipes. 🙂 Thank you for stopping by. I hope you have a great rest of the week. So I made this twice already, hubby and I LOVE IT!!! Such an amazing and easy recipe. One thing we added cuz we had leftovers in the fridge and now it’s an essential for us in the recipe is cilantro on top of the cheese then it melts into it. This is soooo good. Thank you for the recipe, it’s a staple for us now. Hi! Thank you so much for letting me know! I love the idea of adding cilantro to the cheese, what a great idea and a great way to change it up and add a little different flavor. I think I will try that next time. Going to try this!!! Sounds very yummy!! Thanks! We loved this!! I made it for my parents and it was delicious! We put it on a bun and made it into a buffalo chicken burger and it was incredible! Mine is in the oven right now and the house smells wonderful! Where do you buy franks hot sauce?? How would this be stuffed with bleu cheese? It would taste great. I think that’s a great idea. Made this For my husband and sons today for late lunch. THEY LOVED IT!!!! Thank you for the beautiful pictures of the food, and the recipe! (I’m vegan, so always looking for good semi-healthy meals. Total success and SOOOO SIMPLE!! Hi Tricia, I am so glad your family liked it! Thank you for letting me know. Have a good rest of the weekend. I made this for me and my boyfriend and we LOVED it!! Just the right amount of spice and I also added blue cheese crumbles on top 🙂 thanks for the recipe! I am so glad you like it. I bet it tastes great with blue cheese crumbles. Thank you for letting me know. I made this for dinner today. I used cheddar cheese and added some ranch dressing in with the cheese. Very good! Looking forward to the leftovers! Hi Annette, That sounds good. I love the idea of adding some ranch dressing with it. Yum! Thank you for letting me know it turned out for you. Can’t wait to try this! !looks So so good!!! Can you make this with a different type of hot sauce or does the Frank’s hot sauce make it better? I like it with Franks Hot Sauce, but any hot sauce you like will work. Enjoy! I made this last night with a few modifications, I added fresh cut jalapenos and cream cheese to the mozzarella mix, my family loved it, thanks! I love the idea of cream cheese and jalapenos. That sounds amazing! So glad your family loved it! Hi Amber, I hope you enjoy it as much as we do. Thank you for trying it out. I made this but baked it in the oven, it was amazing!! Thank you! Thank you! Thank you! So good! I make it at least twice a month. Hi Mimi, I am so glad you like this recipe. It is one of my favorites. Thank you for the kind words. Jennifer, I don’t know how to thank you! You combined three of my favorite things (chicken, mozzarella and Frank’s hot sauce – God knows how much I love this sauce) and came up with this helluva great-looking/yum-sounding dish. I just read this recipe and can’t wait to try it. Hi, I would bake the chicken on a baking dish at 350 degrees for about 30 – 35 minutes, until the chicken is no longer pink. Made this and wrapped in bacon….to die for!!!!! OMG! That sounds amazing! I love that idea. I bet that was good. I am so going to try that. Could this be baked or would the cheese melt before the chicken was done? Sorry for the delay in responding Emily. Yes, this can be baked. It should be ok with the cheese in it. Let me know how it turns out. super delish! 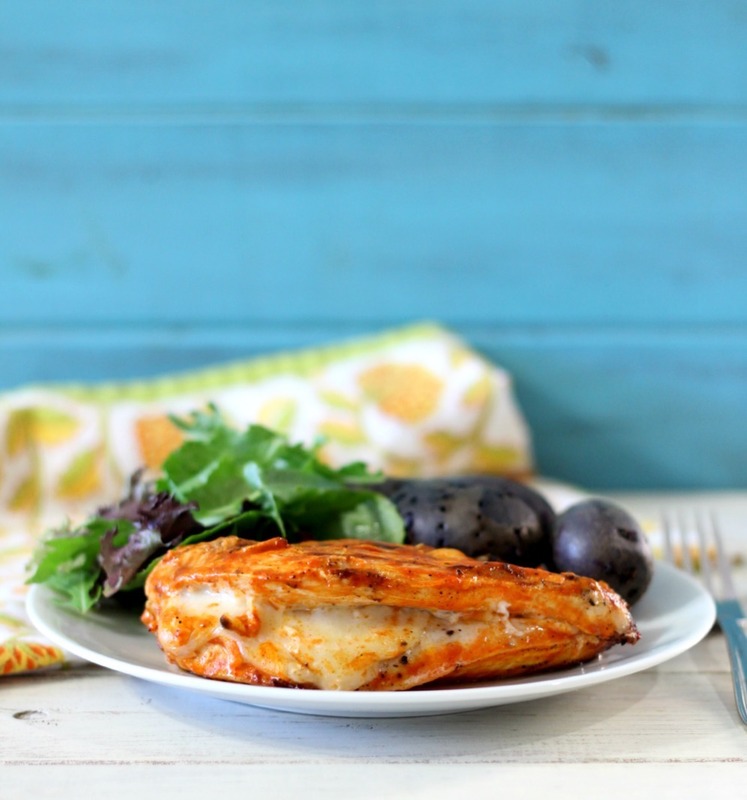 eyeing on these chicken recipe! Thank you Courtney! Let me know if you try it. Thank you for letting me know. So glad your Hubby likes it, it’s one of my favorites. Using Ortega and or grilled jalapenos sound like an awesome idea. I will try that next time I make this dish.I use Franks Hot Sauce too. It’s my favorite and the only hot sauce I use for anything Buffalo Chicken related. Took out some boneless chicken thighs and made this. Wrapped them in bacon to keep the cheese from melting out and baked them in the oven! OMG! I love the idea of using bacon. Great idea. Oddly enough I like to marinate my chicken in yogurt. Makes them real moist. The butter gives it nice flavor, plus it doesn’t make the hot sauce so thick. That is how you make classic Buffalo Chicken Wing Sauce. If you are using wing sauce and not hot sauce, then skip the butter. Going to try this. But I think I will use a mixture of habanero and blue cheese. Lately I have a problem with tough chicken. I try to be careful to not overcook it, but I know it is important to cook chicken enough to prevent problems. Have you had better luck with any brands of chicken? I buy my chicken from Trader Joe’s, but Foster Farms is pretty good too. I sometimes marinate my chicken in greek yogurt sometimes for extra juiciness. Made this tonight in my cast iron skillet, it was soooo good! That’s awesome! I love this dish, so good and easy. Truth be told….it’s Crystal Hot Sauce that any real Buaffaolian uses!!! I’m always craving buffalo chicken! We’ll be eating this a lot ! It’s just so easy. I stuffed mine with blue cheese crumbles and mozzarella and then at the final 5 min, I topped mine with more mozzarella and sauce and broiled it, delicious!! Oh my, that sounds amazing. Love your changes. I am so glad you liked it. I am so glad! I love this recipe, one of my all time favorites. So glad yours turned out. Thank you for letting me know.